The story of Bryant Grain Co. actually began in January of 1952 with the construction of the grain elevator that was operated by the Ray Smyth Grain Co. The grain elevator was constructed by L.C. Durham Construction Company of Vega, TX, and all of the machinery and equipment was manufactured and installed by the Riza Manufacturing Company of Cleburne, TX. The facility was considered to be technologically advanced at the time since it was among the first of its kind to be controlled by an electric panelboard. The grain elevator originally operated in connection with Aledo Feedlots, Inc. which had a feeding capacity of 4800 head of cattle. The Ray Smyth Grain Co. closed in the late 1960,s and the elevator sat vacant with the exception of very limited use until it was purchased by James C. Bryant Jr. in 1981. Mr. Bryant purchased the grain elevator along with a warehouse, scales and a small office. He started out bagging cleaned grains and delivering the products himself. Slowly the demand for his “Triple Cleaned” grains grew and spurred him to add a line of textured horse feeds. Over the years, the momentum continued and a pellet mill was added allowing Bryant Grain Co. to offer a full line of animal feed. Mr. Bryant continued adding products such as minerals, pet foods, salt, tubs, along with many others. By the late 1990’s Bryant Grain Co. was becoming a major player in the North Central Texas region. Our business and product offering continues to grow and innovate to this day. 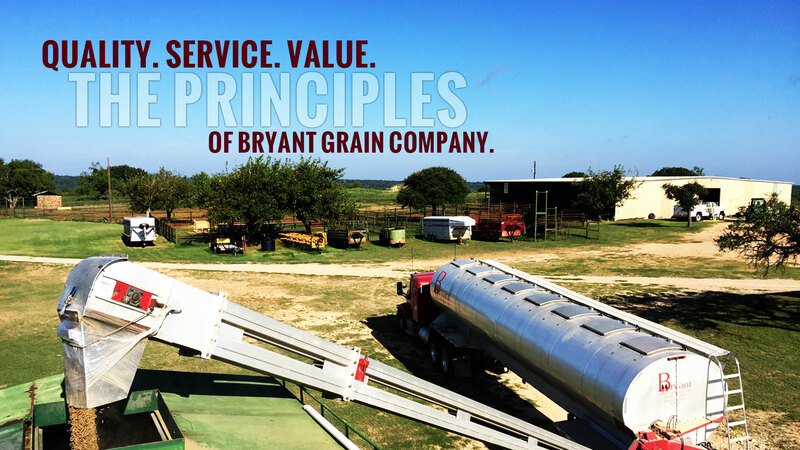 Bryant Grain Co. was founded on the principles of, Quality, Service and Value. These principles are the pillars of our business and these traditions will continue in to the future. 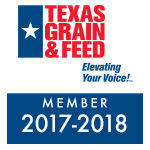 Bryant Grain Company is a full line animal feed manufacturer that distributes products throughout the state of Texas. Our manufacturing facility is located in downtown Aledo, on the western edge of the Texas Metroplex. Whether it is bagged or bulk feed you’re looking for, Bryant Grain and our network of dealers strive to provide the best service and products for our customers.